Striata Inc., a global specialist in secure electronic customer communications, has concluded an agreement to acquire Mass Transmit Inc., a leading provider of email marketing tools, services and expertise. Financial terms of the transaction were not disclosed. Striata provides communication solutions to the world’s largest financial services, utility, insurance, retail and telecommunications companies, helping them achieve unrivaled results by replacing print and mail with interactive electronic documents and transactional messages. Headquartered in New York, with offices in Charlotte, NC and London, Mass Transmit’s proprietary technologies include Email Transmit, a professional grade email platform, and Approved Transmit, a B2B2C communications platform, both used by a broad range of companies and industries to produce effective email marketing campaigns and digital business communications. “Combining our resources with Mass Transmit’s services and platforms, means we can deliver the full spectrum of digital messaging, from secure document delivery and transactional messaging to online marketing and business communications,” says Michael Wright, CEO, Striata. 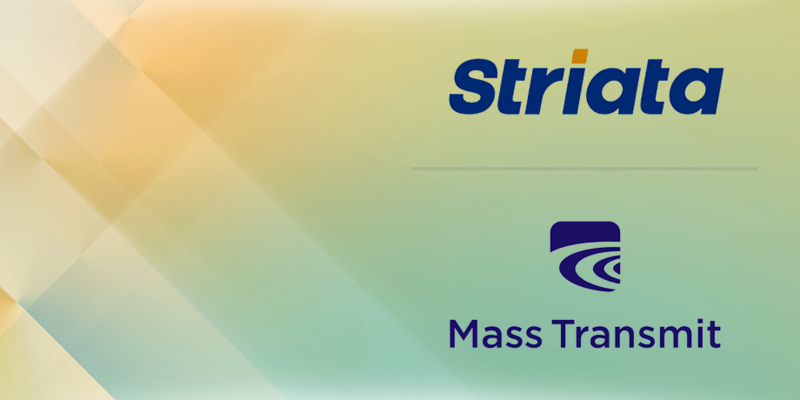 “The addition of Mass Transmit’s expertise to Striata’s services and solutions creates a strong and attractive market proposition, increases our range of offerings and enhances our position as a forerunner in secure, electronic customer communications,” says Mia Papanicolaou, COO, Striata Americas.